One major change is the movie opening with a flash-forward to scene from the third act, similar to what J.J. Abrams did in MI:3. The movie then jumps back a month and story starts from there, eventually catching up to the FF scene. The jewel heist meeting between Ethan and Nyah has been cut because it was tedious and made Nyah out to be an amateur thief who gets caught easily. Now they first meet when Ethan is pursuing Nyah and saves her life. Some of the minor subplot was toned down. Instead of worrying about how Ambrose is going to make money with Chimera, the MI team is mainly concerned with stealing Chimera. Thus, kidnapping McCloy and tricking him into confessing is not necessary. The ending has been changed so that Ambrose does not wake up and shoot at Ethan. In this edit, Ambrose gets knocked out after being superkicked by Ethan and that’s the end for Ambrose. No need to have the cliched ending where the bad guy comes back alive, and the good guy has to kill him for good. - Removed fingertip cutting scene. - Removed kidnapping of McCloy. - Trimmed actions sequences for quicker pacing. - Added new flash-forward opening. - Lots of other minor cuts for pacing. Over 140 edits! 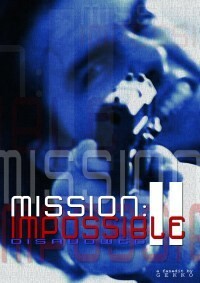 If you must watch Mission Impossible II then make it this cut.